Today we’re making Sweet Potato Pie! 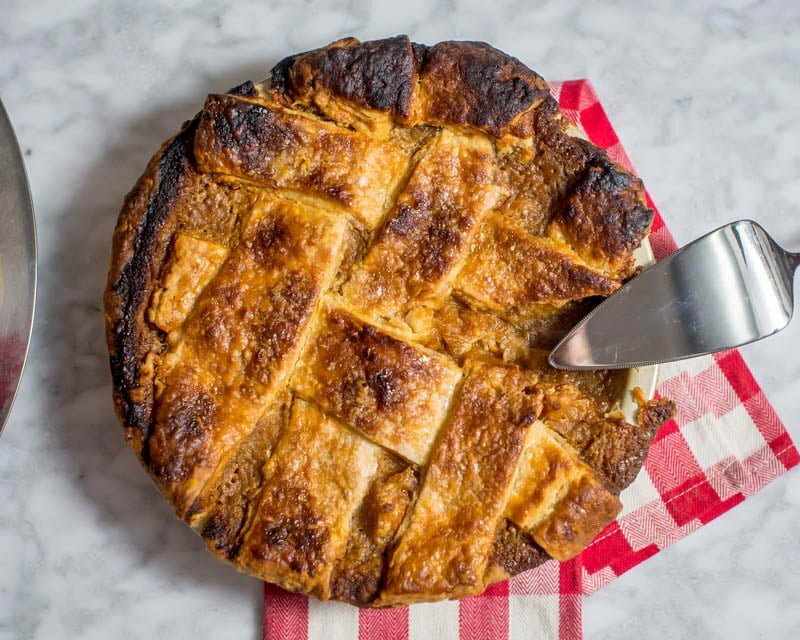 There are many recipes out there, but we like this one from Nicole Rucker because of it’s rustic take on it with a wide lattice and chunky, interesting texture. 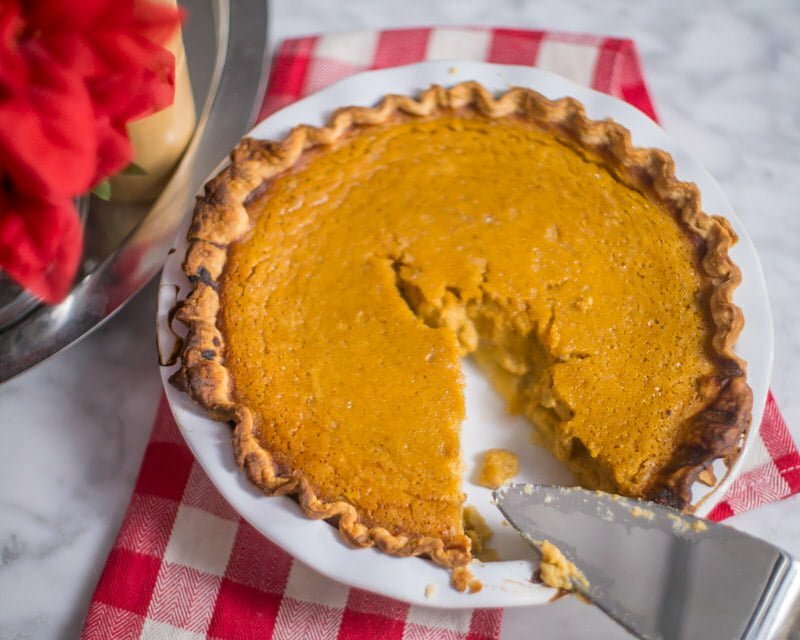 It was our first time cooking a sweet potato pie and were surprised at how easy it was to make. 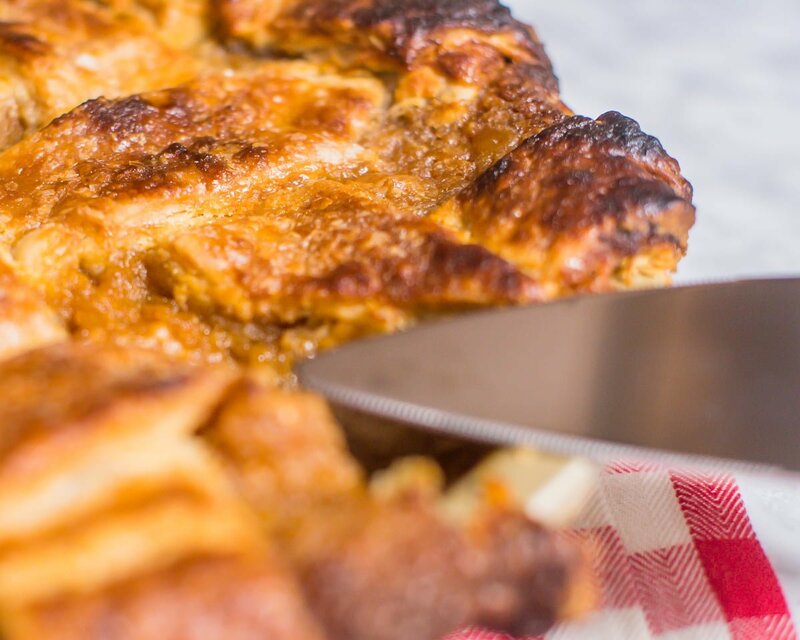 We liked the texture and flavor a lot better than perfectly smooth one-crust pies because of the “bite variation” this recipe offers. The colors got a little goofy on the back half of the video – sorry about that! I was having some trouble exporting the file. Peel yams and cut into 1-2" chunks. Add to a shallow oven-safe dish and add about 1/4 in (5mm) of water. Cover tightly with heavy aluminum foil. Bake at until yams are tender when pierced, about 45 minutes. While yams are cooking, add water, brown sugar, salt, ginger, cinnamon, nutmeg, and butter to a medium saucepan. Bring to a boil. Pour over cooked yams and allow to cool to room temperature. While that is cooling, roll out the bottom pie crust and line the bottom of a 9.5 in pie pan. Set lined pan in freezer for at least 30 minutes. Roll out top crust and cut to 2in (5cm) wide lattice. Remove and discard ginger and cinnamon sticks. Scoop out 1 cup (250ml) of yam mixture. Mash with back of a spoon or fork. Add back to rest of yam mixture and stir to incorporate. Pour yam mixture into chilled bottom crust. 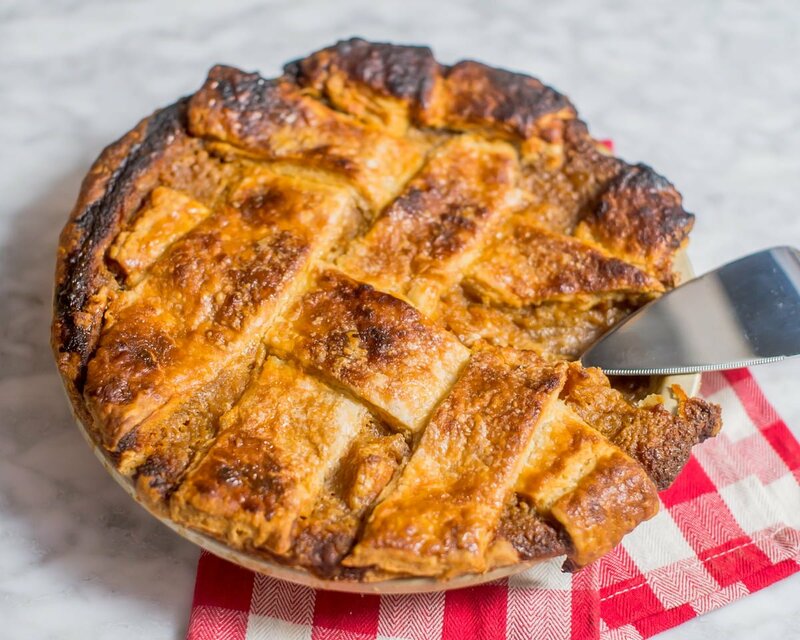 Top pie with strips of dough and create lattice weave. Brush lattice with cream and dust with powdered sugar. Makes one 9.5" pie. Great served warm with vanilla ice cream! This no-shrink pie crust worked really well! 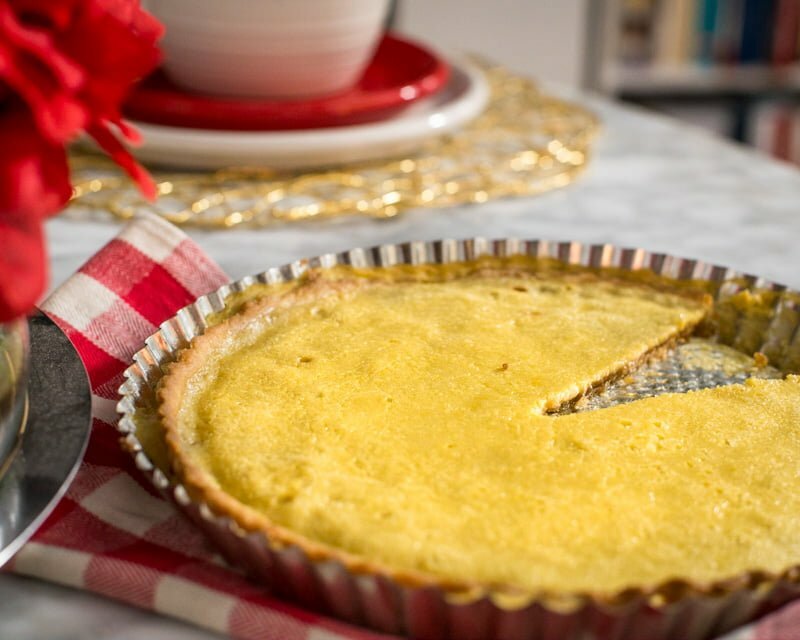 I love the flavor of the sour cream in the crust – it’s slightly tangy in a very pleasant way. The sour cream seemed to aid the browning reactions and added some flavor complexity. It wasn’t quite as buttery as the Bon Appetit recipe, but it was every bit as good. Rolling it out took some patience. It’s a little fussy to work with and there are a lot of steps to bring it together and bake relative to a traditional recipe. In my opinion, it was not as easy to handle as it was advertised by Milk Street. It was supposed to roll-out like Play-Doh, but that was not my experience. I’ll use it again in the future and hope that it will handle better. Please let me know down in the comments if you’ve had the same experience or if it worked great for you! The story of this recipe begins with doughnuts. 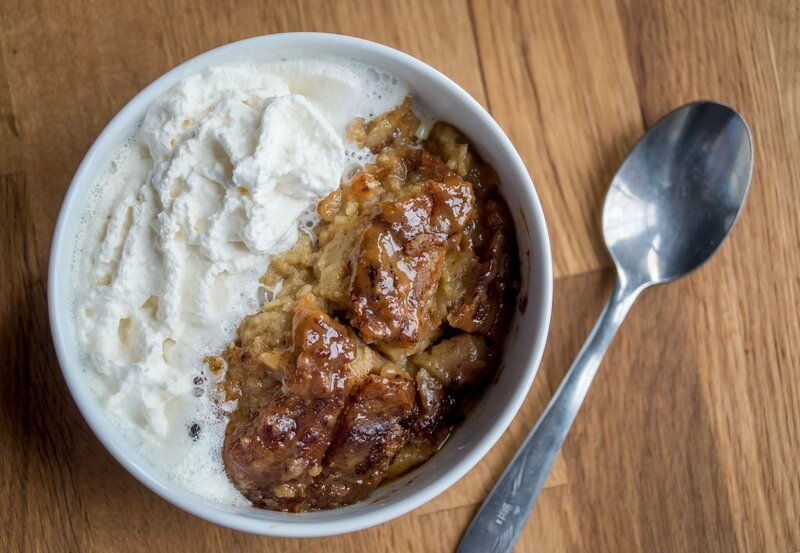 Stale doughnuts turned into delicious bread pudding. Well… maybe not quite. It really starts with pralines and my failure making them last Christmas. But I’ll get back to that. For now, let’s talk about doughnuts. We had a big meeting at work a few weeks ago and I bought dozens doughnuts and bagels for the crowd. Okay, I overdid it a little bit. There was a dozen and a half raised, yeast doughnuts left over that nobody ate and I saw them sitting around the office a few days later. Now I grew up in a family of 8 and learned not to waste food around my house, so I would be damned if I would let these go to waste as well. But what to do with them? My birthday was coming up and I usually liked to bring in doughnuts or something nice for my co-workers. Could I turn these stale ones into something delicious? 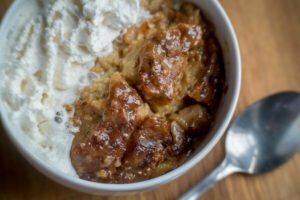 My mind went straight to breakfast casserole or bread pudding and I knew that I could pull some culinary necromancy and animate them into something new. When I was designing this bread pudding recipe, I also knew that I wanted to use sous vide for quality of end result and ease of preparation. I wanted to be able to do the prep work the day before, drop it in the sous vide bath to do the cooking, pull it out when I wake up, finish it and go without having to wake up 3 hours earlier than usual to start cooking. I also knew that I wanted to add an interesting topping on top. 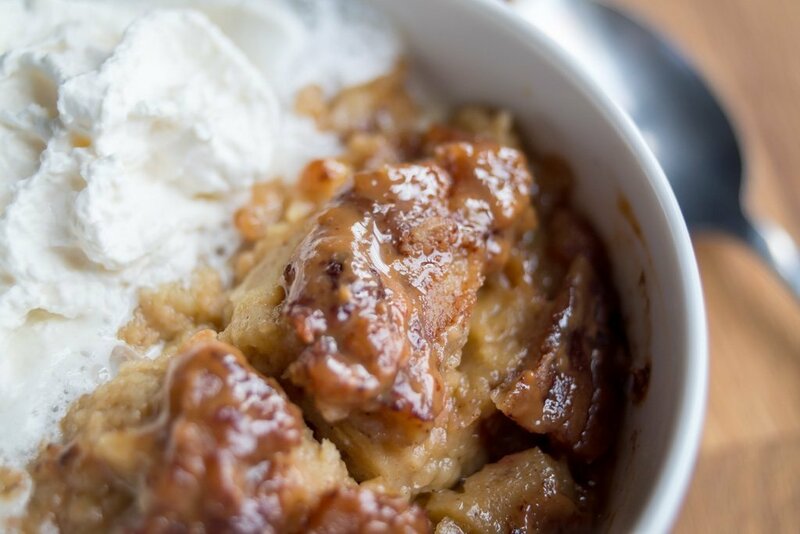 The texture of bread pudding can be homogeneous and uninteresting without some added textural elements. 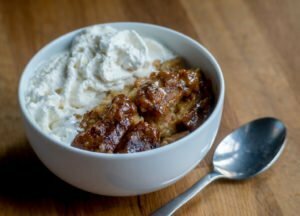 I’m not a huge fan of raisins in my bread pudding, so nuts fit the bill perfectly. Pecans to be specific. And I had the perfect source just waiting for me in my freezer: my failed pralines. Last November, Jill and I swung by Savannah and Charleston on our drive down to Florida. 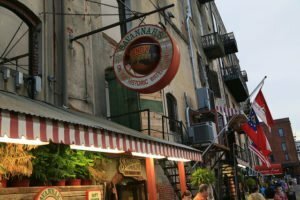 On the Riverfront Plaza, we stopped into the classic River Street Sweets. This place is amazing! They make candy the old fashioned way and it is incredible. Here’s a video I recorded of River Street Sweets stretching salt water taffy on an ancient machine over 100 years old. The machine draws and stretches the taffy, cuts it, wraps it, and delivers it via a complicated journey through a series of belts, elevators, and shoots to the bin where it can be scooped up and purchased. It’s pretty cool! 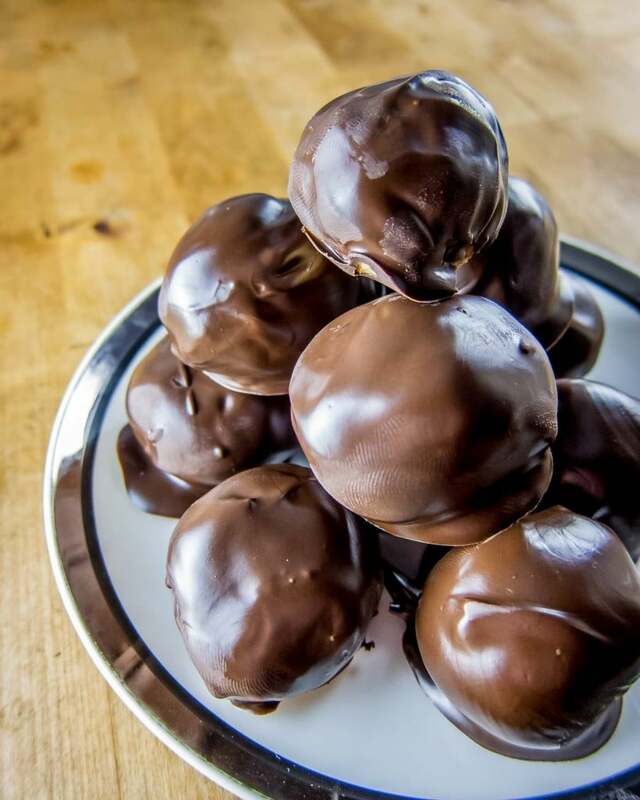 But the real reason you go to River Street Sweets is for the pralines. The sweet, buttery, salty, crunchy confection of the South that is simply irresistible. Once you start eating them, it is hard to stop! So of course, after our trip, I had wanted to make them. I had heard a story many years before on NPR about King’s Candy. Robert H. King had been locked up in Angola for decades for his political activism and I remember that he had made pralines during his time incarcerated. Now that he was out, I wanted to make his recipe for pralines, or “freelines” as he calls them. I dug up the NPR article from 2005 and sure enough, there was King’s recipe. It was a very long recipe to make, contrary to how simple it looks on their website. Hours of boiling milk and sugar on the stove to create a caramel and eventually getting to the hard crack stage for the candy. My failure with the recipe was because, in order to hold all the ingredients that King called for in his recipe, I had to use a 5-gallon thin-walled aluminum turkey fryer. It worked great the caramel started to get thicker, then it started scorching on the bottom. Not good! Sure, I could have kept cooking and hoping the scorched flavor didn’t get into the finished candy or I could cut my losses and end up with the texture of caramels. I played it safe and went for the caramels. After I took it off the heat, I stirred in my pecans like you would for pralines knowing that the finished product would never have the crunch that pralines should have. But the flavor was great and I knew that they would be delicious as a topping on ice cream or something else in the future. So I froze them and waited for the right time. I’ve always been a lucky guy. My favorite stoic, Seneca the Younger said thousands of years ago, “Luck is what happens when preparation meets opportunity.” Bingo, Seneca! I was prepared with my pralines and here was my opportunity! And with that final decision of my topping, my bread pudding recipe was complete! I made it for my birthday and brought it into work. Everyone who tried it told me that they loved it and some asked if I would share the recipe. I figure that if I share the recipe at work, I may as well post it here too. A few of thoughts on preparation. I used sous vide because the timing in my specific case, but you can easily bake it instead and I gave instructions for that too. 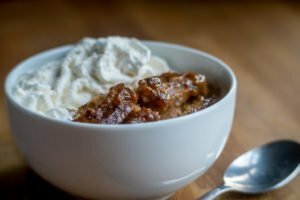 I used my leftover failed pralines for my caramel pecan topping, but for the recipe, I’m assuming that you don’t want to spend 4 or 5 hours stirring a pot of boiling milk and sugar. Therefore, I’m calling for prepared caramels and toasted pecans instead, which will get you really close. And finally, the recipe I present here is the original size I made, but it can easily be scaled down significantly. You can cut it in half, quarter, etc. quite easily and still get great results (round up if there gets to be a fraction of egg yolks). And finally, on doughnuts. I used raised doughnuts since they’re really close to bread, but I would think that cake doughnuts would work fine too, especially with the long soak in the custard. Many stores sell their day-old doughnuts for dirt cheap ($2.24/dozen at my local grocer), so you can make this recipe inexpensively. Or collect your stale doughnuts in the freezer until you have enough to bake with and make the recipe then. While this recipe really doesn’t fit into our Explorer’s Kitchen adventure for foods around the world, it was a fun project to make and we think that your family will love it! In the end, I was able to turn two failures into a massive success. Cut the doughnuts into roughly 2” (5 cm) sized pieces and spread evenly on parchment lined baking sheets. Bake for 15 minutes rotating sheets halfway through until doughnut pieces are just dry. Remove and cool for about 10 minutes. Meanwhile, in a stand mixer with whisk attachment, whisk sugar, maple syrup, egg yolks, vanilla, salt, and cinnamon until well combined. Add milk and cream and whisk until incorporated. In a very large bowl or very large vacuum/zipper bag, add cooled, dried doughnut pieces. Pour custard mixture over top and mix thoroughly with spoon pressing down on the bread so that it soaks up the custard. Set sous vide bath to 170F (76C). Fill one or two gallon freezer bags with the soaked bread/custard mixture. Press as much air out as possible and seal. Lower bag(s) into sous vide bath and cook for 3 hours. Set oven rack to the top position and set to broil Low / 400F(200 C). Add contents of both bags to a deep 9x13 in pan (33x23 cm) (if your pan is shallow, use an additional 9x9 in/23x23 cm pan). Even out pudding in pan, then “rough-up” the top with a spoon leaving some peaks and valleys. Brush with melted butter and dust the top with cinnamon. Set pan under broiler until top is toasted and golden brown, about 5 minutes. Meanwhile, melt caramels in a saucepan or microwave. Stir in pecans and pour over toasted pudding. Return to oven until caramel starts to get brown spots, about 3-5 minutes. Remove and optionally allow pudding to set for 30-45 minutes. 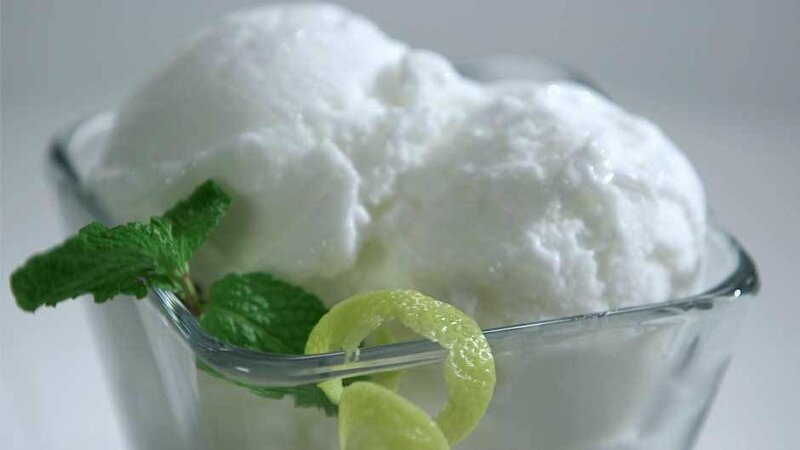 Serve with with vanilla ice cream or whipped cream. Fill a deep 9x13 in pan (33x23 cm) with soaked bread/custard mixture (if your pan is shallow, use an additional 9x9 in/23x23 cm pan). Brush top with melted butter and dust with cinnamon. Bake until custard is just set. Test for doneness by pushing down in the middle and no runny liquid should be there (about 50-65 minutes). Remove from oven and cool on a wire rack for 45 minutes to cool and set. Meanwhile melt caramel and stir in pecans. Spread caramel and pecans over cooled bread pudding. Return to oven until caramel starts to get brown spots, about 3-5 minutes.